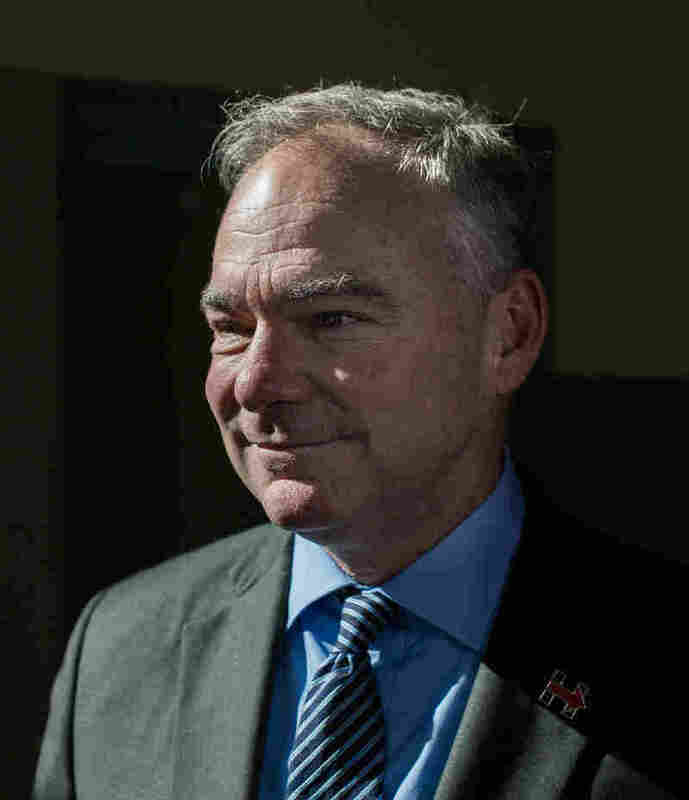 NPR Tim Kaine Interview: Full Transcript NPR's wide-ranging interview with Virginia Sen. Tim Kaine covers Hillary Clinton's transparency, the nature of Donald Trump's support, Kaine's experience as a missionary in Honduras and his faith. Democratic vice presidential nominee, Virginia Sen. Tim Kaine, held a town hall at the Exeter Town Hall in Exeter, N.H., on Thursday afternoon. Democratic vice presidential nominee, Virginia Sen. Tim Kaine, spoke with NPR's Steve Inskeep. Steve Inskeep: I ran across an interview that you did in 2008, in which you said to Charlie Rose that, you said in this interview, that you believe that voters primarily decide on the character of a candidate. Sen. Tim Kaine: I do. Yeah, I do. Is that still true in 2016? I think so. Yeah, I think it is. The issues are really important, but usually they need to connect to a broader view that a voter has about a candidate. And I think that that's very important. And one of the reasons that is the case is that we can talk about issues but you can guarantee that a president will be dealing with some issues that we're not talking about at all, something that will come up in a year, or three or four years that we didn't talk about. But if they have a sense for who you are, then they have a sense for how you are going to handle the issue, whatever it is. And I think that that is important and it's still very important. If it's about character and you've been able to raise so many issues about Donald Trump's character, why is the contest so close? We're a politically very divided nation. And Steve, I come from a state that is really battleground. You know, when I got into state politics in the early 2000s, it was incredibly red. Now we've worked it to battleground, maybe slightly blue in a presidential year. But Virginia is a microcosm for the rest of the nation and we're very closely divided. And that means these elections tend to be close and this one is not going to be any different. But what is it about Hillary Clinton, that when you say she's more experienced, she's ready in this way and you believe it's about someone being ready for whatever happens in the White House, that you're not persuading a lot of Americans? Well rather than answer for others, let me just answer for myself. The reason that I'm so sold that Hillary's going to be the right president is, is character. I tell people character and public life is probably best measured this way: if you look at somebody who's an official and you see, you look to see do they have a passion in their life that showed up before they were in politics? And have they been consistent in following that passion, whether they're winning or losing, in good years or bad, in or out of office, Hillary Clinton has that. Since her exposure to a really influential Methodist youth group minister when she was a teenager, she has really measured her life by trying to provide and create opportunities for families and kids. Out of the theory that if you do that, the rest of society will be stronger. And you can see that as a consistent theme throughout her life. And so that's something that I try to talk to voters about. I sometimes feel like I have an easier time bragging about her than she would feel talking about herself. And I think at the end of the day that is going to be a difference-maker, because the consistent theme in Donald Trump's life is himself. But the theme in Hillary Clinton's life is this families-and-children-empowerment which is something that is still so needed. Secretary Clinton was asked on CBS, "Why did you pick Tim Kaine?" And one of the things she said was, "I want someone who can tell me when I am wrong." Have you told her that yet? You know I'm not going to talk about my communications with her in that way but I'll tell you this Steve. Can you just give a yes or no? Have you told her she's wrong about anything yet? We have disagreements about things and we've talked about them. We do. And that's not that unusual but we do talk about them. I was the lieutenant governor to a wonderful governor, Mark Warner. Played the same role with him. Would share with him anything I thought, including if I thought he needed to do something different, but I didn't share it publicly, I shared it with him. I was essentially in the same role as a national party chair with President Obama, promoting his policies but also sharing areas where I thought, hey, I think we could do better if we did this or that. I didn't do it in the press. I did it to him directly. So I've had some experience not only being the top person, but I've had experience being in this role where you're trying to offer the absolute best advice you can to the person that you know is the one that's making the decisions. And I relish that role. And Hillary and I have talked extensively about the way that she wants me to play, and I feel very comfortable with the partnership. Even though you're both travelling in different places, you've talked a lot? Yeah, we do. We communicate often, in different ways. We campaign together some, but we also try to cover more real estate and campaign separately, but we communicate a lot. You said in an interview in July that, quote, "We will be very transparent," talking about the administration you hope to be part of. Transparency with Secretary Clinton was raised again because of the way that she handled her illness in the last few days. How, if you're elected, will you draw the line between what you tell the public and what you don't? Well, on the illness thing, I mean I had some experience with this, too. When I ran my first race in 1994 for city council, I got pneumonia during the race. And I didn't tell everybody I have pneumonia. Instead, I did what I could. I tried to power through. And I powered through at about 70 percent, not a hundred percent. Hillary had that attitude. This is, nobody who knows her doubts her work ethic. She works very, very hard. And after she had that diagnosis, she said I think I can power through this and then she found out after about 48 hours maybe it won't be quite so easy as I thought. And then she did let folks know what was going on. Is that really all there was to that? Because many people speculated that she felt under pressure because Donald Trump had been talking about her supposed illness and so forth. You know a lot of people, and I think about a lot of women I know. They're just used to to powering through situations. They get sick. They don't have paid family leave. They get sick. They're at work. They got kid stuff to deal with. They, they're used to being sick and still doing stuff. And that was her initial take. Okay, I got diagnosed. Remember, I was with her like, four or five days before she got this diagnosis. We were doing Labor Day campaigning. She had a little allergic coughing thing on stage. But she said I'm finishing this speech. And then she went on to the Quad Cities and did another event later in the day. And then she did a commander-in-chief forum in the middle of the week. And then she had a round table with national security professionals. This is a person who has a lot that she wants to get done. And she just decided, look, I think I can power through this. And you know what you find is you can't do it at a hundred percent. You have to scale back a little bit. But she's back out on the trail today in Greensboro with a number of events coming up in the next few days. And I know she's really, was really raring to get back out on the trail. Let me ask about something that you said here in New Hampshire in the speech that we just watched, Senator. You're running against a man, Donald Trump, who has repeatedly made statements suggesting that President Obama is somehow connected to some foreign influence. You then talked about Donald Trump in your speech, and you questioned his overseas business dealings, what they meant. You quoted Matthew: "You can't serve two masters." Are you saying the same thing about Donald Trump that he was saying about President Obama? He is influenced by some foreign force? Well I actually, I'm not sure that I, I'm not sure, Steve, that I said that's what Donald Trump said about President Obama. I can't remember that part of my speech. You didn't say that in the speech. He has said that over the years. What you talked about was his foreign business dealings. Well he, I'm just using Donald Trump's own words and the lack of any disclosure. So Donald Trump was pitching it as an affirmative, you know, proof-point for his candidacy during the Republican debates: I'm doing 120 business deals around the globe. That's fine. Well then, but why don't you show us what they are? And the Newsweek story yesterday is very, very powerful in laying out a number of areas where it could at a minimum be a significant conflict of attention as he's watching these money-making endeavors that produce income for him and his family. But it also raises very significant questions about his connection to foreign governments and would he really put the U.S. interest first? I mean we are talking about an individual who got up at a microphone and publicly encouraged Russia to engage in cyber-espionage and find material and give it to him so he could help win the election that way. Now later he said oh, I was just trying to be funny, but that's just not funny. I mean I'm on the Armed Services and the Foreign Relations Committee. Encouraging Russia to do that when they have a track record of trying to destabilize elections. It's just not funny. So given his own statements, I just think that he needs to disclose his business interests, his taxes, his health information. It's what voters expect. It's what Hillary Clinton has done. What did Secretary Clinton really mean by the "basket of deplorables" remark the other night that she had to clean up? Two things. She meant look, if you look at, and remember she was talking to a group that was fairly friendly. And she was telling that group you need to know something about Donald Trump's voters. There are some who are motivated by dark emotions, that are not in accord with American values. I mean when you have David Duke doing robo-calls telling people to vote for Donald Trump, which he did just a couple of weeks ago, that is highly troubling. And she was basically saying some of Donald Trump's voters are motivated by these dark emotions that really are out of step with American values. But she also said to the audience: but remember, some of Donald Trump's supporters are also people who have deep economic anxieties, maybe because of the place that they live or the industry they were trained up in. And we have to be responsive to those. She was not belittling those anxieties. She was actually telling a group of supporters of hers, there are Trump voters who have concerns that we need to speak to during the campaign, and that we especially need to speak to if we have the opportunity to govern. Although there's something about the setting that perhaps added to the jarringness of that moment. Because she's in a room full of prosperous people, and analyzing ordinary folks out in the country in a way that people found offensive or patronizing. Some people did anyway. You know here's what I think about it Steve. What should you do. If you are confronted with a David Duke being active in the campaign and encouraging people to vote for Trump, or a Donald Trump re-tweeting messages or material from people connected with white supremacist organizations. Are you supposed to just be silent about it? I think silence in the face of divisive, bigoted comments allows it to grow. And so you can't be silent about it. I think you have to call out comments or behavior that are contrary to our values and if you don't you actually allow it to grow. And that's what she was doing. What do you think about people around the country who aren't David Duke but are in some way anxious about the demographic change in this country? Are they racists? What do you call them? No, I have a lot of experience in this in Virginia, because I've made my whole career in Virginia. You know, Virginia was a state that when I was born, wouldn't let kids go to school together if their skin colors were different. When I was born, women couldn't go to the University of Virginia. When I was born, one out of a hundred Virginians had been born in another country or very nativist. Today, 58 years later, we've opened up the doors of our schools and our universities. One out of nine Virginians was born in another country. And Steve, you know what happened in that 58 years? We went from bottom 15 per capita income to top 10. By being exclusive and keeping people out, we were hurting ourselves. And by the time we actually started to open the doors of opportunity, we helped the state. There was anxiety along the way. They were battling against school desegregation. My father-in-law was the Republican governor of Virginia who integrated the schools in 1970, 16 years after Brown v. Board because segregation had been maintained. And he was hated for that. So there was a lot of anxiety about it, but it was what I call a transitional anxiety. When the demographics start to change and what you have assumed to kind of be constant turns out not to be constant, there's anxieties. But you go through a transitional period and you realize, hey wait a minute, these demographic changes aren't bad. It's not bad to have people sitting around a table together. It turns out that they're good. They helped our state. They help our country. And so I have actually a high degree of confidence that over time those anxieties tend to go away. Human beings have always been afraid of change, of all kinds. Change can be, can produce anxiety. But I mean people thought they'd gone away when President Obama was elected in 2008. I don't think anybody thought that. I think people thought when President Obama was elected, we were taking a step forward. We were entering into a new chapter. But it would be hubris to think that human nature had fundamentally changed and we weren't going to have some of the same challenges that we have had as a species. But I do, I deeply believe that while some of these dark emotions are motivating some of Trump's supporters, I put those into kind of a, I put it into a transitional phase where we will be, we are stronger together. We really believe it. That's not just a bumper sticker. This is what Hillary Clinton and I are running on. And our nation is such a beacon to the rest of the world. I mean, I just add another one on this: Donald Trump has advocated often during this campaign we should treat Muslim-Americans differently or potential Muslim immigrants differently. There should be essentially be a religious test. But here's who we are as nation: Jefferson wrote it in a statute in Virginia. It was in a statute in Rhode Island, then Madison put it in the Constitution, in the First Amendment: you cannot be preferred or punished in this nation because of how you worship or even if you don't worship. We're going to treat everybody the same. And it has been so positive for us. It's worked so well. And we're an example for the rest of the world because so many people live in countries where that's not the case. And so is there, have there been anxieties about other religions? Sure, but we're a stronger nation because we've tolerated this great breadth of religious diversity. Did your experience living for a time as a young man in Honduras in any way affect how you think of immigration to the United States now? Yes. Yeah, it definitely did. Well, in a couple of ways. You know Donald Trump said once during the campaign Mexicans are rapists and criminals. I lived in Honduras, in a very poor community but I basically came to see, after I developed a language fluency that enabled me to understand, I came to see the same values in the people that I lived with that my parents were telling me to follow. The values of family and faith and hard work. And so when you see those basic values, good values, animating people, you never will tolerate somebody just using a broad brush to trash somebody because of their national origin. It also made me think of people in light of my own family's experience. All of my great grandparents coming here from Ireland and Scotland. And look, negative things were said about the Irish when they came. Negative things were said about the Italians when they came or about Jews coming from Central or Eastern Europe. And yet no one could deny if we look back at our history that we have been continually kind of re-energized and expanded in our maturity and our understanding and our innovation by the new ideas of immigrants. And so I tend to think about immigration in that way, having lived in Honduras and thought about my own family's experience. Some Americans will know that some pretty terrible things have happened in Honduras in recent years. Lots of people have had to flee. The economy is not great at all. Do you have some understanding for people who look at those news headlines and what they see south of the border is a problem, is a threat, something they don't want here? It included more border security? A lot of border, of course you need to do that. Of course you need to do it. But the other thing I know about Honduras, why are kids fleeing? They are fleeing because of violence in their neighborhood. And so when a parent lets a child go to come here because they're so worried about their own neighborhood, it has to call a little bit on your humanity, especially because in Honduras much of the violence is driven by a drug trade that's fueled by the United States' demand for drugs. We send the cash down and the drugs come up. And so that violence in these little neighborhoods, in San Pedro Sula and El Progreso and, you know, where I lived, it's not unconnected with the United States. It is connected to the demand for illegal drugs in this country. And that's what's making so many of these neighborhoods dangerous. And so what it means is that we have to have a smart immigration policy, but we also ought to do things to help these nations deal with their public security challenges. The president of Honduras said something really powerful to me: what nation would want to export its young people? We want to keep our young people here. To build a future here. And that's what, and families and kids want to stay where they're familiar. But we need to do work together obviously to help. I just watched a speech in which you quoted the Bible, and referred to your Catholicism, which you've done often. To what extent have you had to struggle with when to follow your faith in your public life and when not to do that? I think if you're a person of faith, personal opinion: If you're a person of faith, you're going to struggle. Even if you're not in public life, you're going to struggle. Because the commands of love your neighbor as yourself, not easy. You know. And who is my neighbor? Not just my neighbor but somebody I don't even know. That's not an easy command. It's very difficult. So I think you always have to struggle with it. And in public life, yeah, you do struggle. But I do feel very strongly that my Catholicism is about the way I live and the rules that I follow. And even if I, even if they're hard or even if I don't necessarily agree, it's the rules that I follow. But I don't think my job as a public official is to make everybody else follow the Catholic Church's teaching, whatever their religious background or lack of a religious background. That First Amendment again, it's there for a reason, and it says that not only that you can worship as you choose or not. It also says we won't have an established religion. We will not put one set of religious doctrines higher than others. And so on many of the questions that I, you know, that I would struggle with, different religions have different traditions and preach different things. And I don't think, in fact I feel this is a really important principle and it's a moral principle, not just a governing principle, it's a moral principle: we are better off as a society when we're not trying to enforce the views of one religion over everybody. People can make their own moral decisions. Well tell me something about your own evolution on this. I'm thinking about when you were chosen as the vice presidential nominee. There were women's groups, women's rights groups who, women's health groups who spoke up about this and said, we didn't always like what he did when he was a local or state official. We do very much like his record in the United States Senate. Have you changed over time in the way that you approach this? I mean, just to give you an example. One of the things that I supported in Virginia and still support, is if a minor wants to seek an abortion, then a minor would need parental consent. But you need to provide a mechanism if the child is in an abusive relationship or something like that, where there can be a court hearing to determine whether the youngster is, you know, basically mature enough to make that choice on her own. That's a rule that a lot of groups, you know, wish was not in place. I supported it. I haven't really changed my view on that. I really basically support the holding of Roe v. Wade, which says especially early in pregnancy women get to make this decision on their own. Government can't burden that choice. But Roe v. Wade did acknowledge that there can be some rules and there have been some rules that I've supported, but others I've opposed. For example, the Supreme Court decision this summer about states that try to impose onerous clinic regulations. That's clearly an attempt to overturn Roe v. Wade by another means and I've always opposed those including when I was governor. One other thing Senator, I feel that the vice presidential candidates haven't gotten all that much attention yet just because the candidates at the top of ticket get so much this time around. Who knows? Well, I'm not sure that it is and that's where I'm going with this. The last three vice presidents have turned out to be quite significant people in the government. Can you flesh out at all what kind of role, what specific role you would have as vice president if elected? Well, this is something that, you know, a President Clinton and I would work out. We've talked about it to some degree. I really admire Joe Biden and the role that he has played with President Obama has been, let me be there when you make every important decision. Let me offer my two cents 'cause I have something to offer. But let me also learn from the decisions you make. It's a two-way street. And I do think my career, from being a missionary to being a civil rights lawyer in local, state and federal government, I have something to offer but I also have something to learn. So the main role that I would want to play would be to do just that. To hopefully make the Clinton administration, you know, the most successful ever. There are a few things that I think I'm good at. I really care about governance. You know making government work better from having been an executive in the past. I care deeply about the Americas. I think that often our foreign policy has had an east-west axis but not a north-south axis. And so Americas issues are things I care a lot about. And then the first pillar of the Clinton campaign, which is can we build an economy that works for everybody, not just for a few. I was a civil rights lawyer for 17 years. I care deeply about the equity. But I was also a mayor and governor doing economic development deals. I care a lot about prosperity. I care about shared prosperity and I think that everybody who works in a Clinton administration is going to be working on that challenge. And I think that there are some pieces of that I'm very well suited to because of my background. Would you have a specific portfolio? You mentioned the Americas. I'm thinking about the way that the first President Bush, when he was vice president, his portfolio was the business community. Would there be something that would be your responsibility? You know, I think the key, if you take on specific responsibilities, the challenge is, and just, and I think v-p's have kind of grappled with this, does that take away from being there in the room at all the important decisions? That's what you want to do first? And so you really need to balance it out. But I would say the top priority is just trying to be a good colleague and adviser on the important decisions. That's priority number one. And then, you know, other duties as assigned, as they say. There are some things that I'm good at but I am willing to do anything that will be helpful to the administration. You know, I can work with mayors and governors. I mean that's something that I can do because of my experience, and often, you know, mayors and governors say, if only Washington understood us. Well, you know, they're going to have somebody in me who does understand them a little bit. So there's a lot of things I could do but the important thing is what does President Clinton think I could do most helpfully. That's where I'll spend my time. You bet, Steven. Good to be with you.